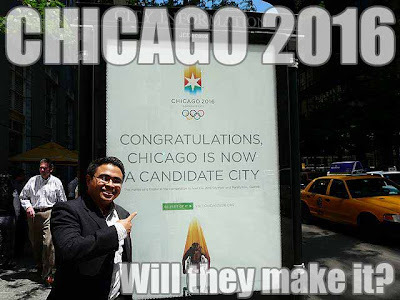 There was so much buzz in Chicago when we arrived there since they had recently been named a candidate city for the 2016 Summer Olympics. They're up against Tokyo, Japan (which hopes to host the Olympics for the second time, it's the front-runner having scored the highest in the preliminary rankings), Madrid, Spain (one of the few major European capitals which has yet to host the Olympics, it was also a candidate city for the 2012 Olympics), and Rio de Janeiro, Brazil (which hopes to bring the Olympic Games to South America for the first time). Michael Jordan is currently the unofficial spokesman for the Chicago 2016 bid. Chicago was supposed to host the 1904 Summer Olympics but it was moved to St. Louis to coincide with the 1904 World's Fair. They also bid for the games in 1952 and 1956 but with no success. Will they be lucky this time around?